Please see below some testimonials from our clients… If you are or have been a customer of D.Plumridge and wish to leave some feedback or a testimonial please use the form at the base of this page. Alternatively you can email us (address at base of site) and we will upload your comments for you. – Your website, and evidence of your professional competence – Checkatrade, awards and so on – were very important in getting us started. Your own visit, and the chance to see a driveway of the sort that we thought we wanted, were crucial. Just had the front driveway and footpath replaced and can say the team did a fantastic job, it’s totally transformed the front garden. We had to wait a while before they started the job but was worth the wait. We had our drive and sideway transformed by a professional, knowledgable team. Thank you to Dave and his team for getting the job in a great time and were a pleasure to have around. We wasn’t sure on the way the steps should go, Dave advised us and are we glad we trusted his experience, Great job and exactly right. You might have to wait a bit, but that’s because Darren is busy, I would be worried if a company said right we can start next week. Perhaps there is a reason for it ? Didn’t pay a penny till the job was done, thats the confidence they have that the job is going to be right and you can sleep easy! We have had many compliments on how the front now looks and something to be proud of. I’m not sure anyone relishes the idea of spending thousands on a new driveway or patio -HOWEVER – to say we are thrilled with our new driveway would be an understatement! We had put off the renovation for too long and looked at quite a few contractors before selecting Darren based on a recommendation. We weren’t wrong. His foreman Dave and the team were polite punctual and professional from start to finish. Darren was also on hand to deal with queries and niggles, we felt listened to and more importantly guided to make the right decisions based on their experience. They really do listen and care about getting the job done in the way you want so we’re glad to write this and recommend them. Thank you – we are happier than we thought we could ever be with a new driveway!! Thanks to Darren and his team for a wonderful job. We are extremely impressed with our new driveway and front porch step. The team are very friendly, professional and courteous. We would not hesitate to recommend Darren and will look no further to hire again for when we choose to do our back garden in the future. Thanks for a brilliant, professional job! Darren’s team have just completed our driveway and new patio. The work was performed conscientiously and in a way that reduced the impact to ourselves and our neighbours. Darren and his team made suggestions that looked most attractive in the finished work. A professional job in every way. Please see below some testimonials from our clients... If you are or have been a customer of D.Plumridge and wish to leave some feedback or a testimonial please use the form at the base of this page. Alternatively you can email us (address at base of site) and we will upload your comments for you. We approached Darren Plumridge for a quote to construct a sizeable rear terrace and a front driveway with walled garden. He was not the cheapest quote, but he took time to visit us twice to discuss our requirements. He is very knowledgeable and experienced. He provided addresses so we could see other work he had completed in the local area. He is also incredibly busy. We were prepared to wait 16 weeks for him to arrive on site to start work. The Plumridge building team are a very pleasant bunch. They worked in all weathers to get the job done. Both the team and Darren were very patient with our comments and they sort to make the job the best it could be. His company tag line “Assuring you of my best attention at all times” definitely applied. We are very pleased with the final result, and I would recommend Darren without hesitation. We had our patio and driveway done by Darren and his team in 2009. They were extremely professional, worked hard, and the quality of their work was excellent. They took great care over the finest of details. We were and continue to be absolutely delighted with both the patio and driveway. Of course, weather and constant use meant that 10 years later we needed some minor repair work done to the grouting of the patio. As before, the quality of this repair work exceeded our expectations and we’re delighted with our rejuvenated patio. Darren was also very helpful with useful advice and tips. We would, without hesitation, highly recommend Darren and his team. Darren and his team laid a new drive to my mother in law’s large house in Clapham . He stood out from the other contractors from the very beginning, providing helpful advice , useful guidance and a fair price. The customer service from him and the whole team was above and beyond in all ways. There was quite a long lead time, but we are so glad we made the right decision to wait and go with Plumridge as the end result is just superb. I cannot recommend them highly enough and have already asked him to quote for our own back garden paving and walling. He came round, measured up and a day later the samples are all in the post and a quote on my desk. Thank you Plumridge- fantastic service. My new large drive completed. My new large drive completed. A lovely job. The young workmen were very helpful, polite and courteous. Thank you. It looks great. Diana. Darren and his team have recently finished 2 jobs for us – 1. replacing our front drive, front garden and front wall, and 2. some paving and landscaping work in our back garden. They have done a super job and we are very happy with the end results. Both areas are transformed. We arranged the work with Darren before the summer, and agreed to wait 3 months before the work was done given existing projects underway. We are pleased we did – definitely worth the wait for quality workmanship. A few things stood out in particular – they were very co-operative and worked with us to achieve what we wanted. Courtney the foreman and his workers were very polite at all times, respecting our property which we appreciated. We also asked for a few additional works to be completed across the job which were completed in line with the overall work and in the agreed timeframe – again something that was a big help for us. Thanks to Darren and his team – would thoroughly recommend and will certainly use again one day. Darren’s team built us a high quality cobbled driveway, which has already attracted admiration from passers by. They were courteous and considerate throughout, not just with us, but with our neighbours too. The site was left immaculate. Darren also recommended a great plumber/electrician. Great job! As mentioned in other reviews, Darren does have a long lead time and we had to wait slightly over a year for our initial installation. 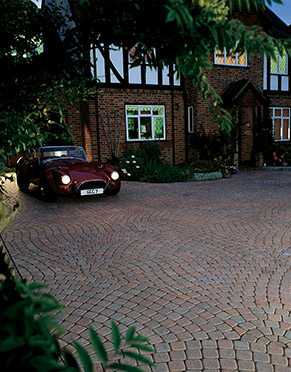 We were very happy with the quality of work and particularly the kerbing and lighting. Courtney and the guys were fantastic, really friendly, helpful and approachable. Unfortunately, we had a bad batch of Marshalls blocks, and this is where I have been particularly pleased that we had chosen Darren. As an approved Marshalls contractor, once we raised our concerns, Darren referred the issue immediately to his contacts at Marshalls who in turn made several site visits and tested the blocks. Marshalls agreed to replace the blocks (with Darren as contractor), and the drive has now been re-laid. The finished drive now looks really good and we are very pleased with it. It was also nice to see some exceptional after sales service, with Darren arranging for some minor repairs and also to kindly replace a block that had an oil drip from a delivery driver.